In 4-quart nonstick Dutch oven, heat oil over medium heat. Add onions; cook uncovered 10 minutes, stirring frequently. Reduce heat to medium-low. Cook 35 to 40 minutes longer, stirring frequently, until onions are light golden brown (onions will shrink during cooking). Stir in broth, thyme, pepper, bay leaf and soy sauce. Heat to boiling. Reduce heat to low; cover and simmer 15 minutes. Remove bay leaf. Meanwhile, set oven control to broil. Place baguette slices on ungreased cookie sheet. Sprinkle cheese evenly on slices. Broil with tops 4 to 6 inches from heat 30 to 60 seconds or until cheese is melted. Watch carefully so cheese does not burn. To serve, ladle soup into bowls. Serve with baguette slices. 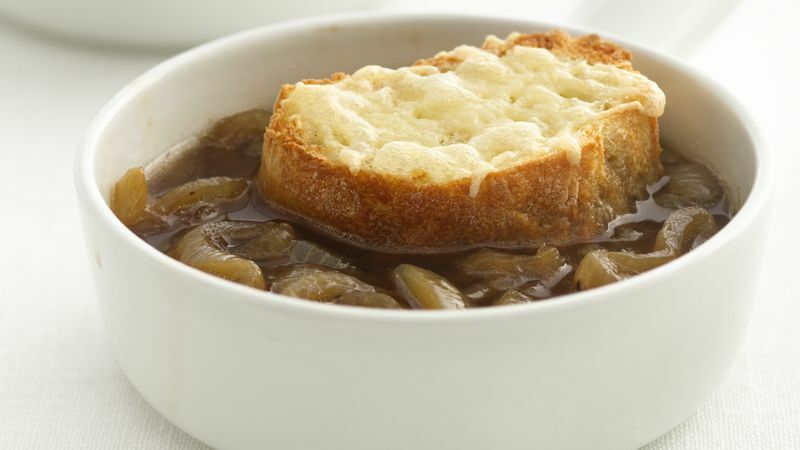 We've added reduced-sodium soy sauce to this healthified version of onion soup as a flavor enhancer. Be sure to use shredded fresh Parmesan cheese rather than the powdery grated variety. You'll get a better melt if you start with a brick and shred it yourself, but you can also use preshredded.